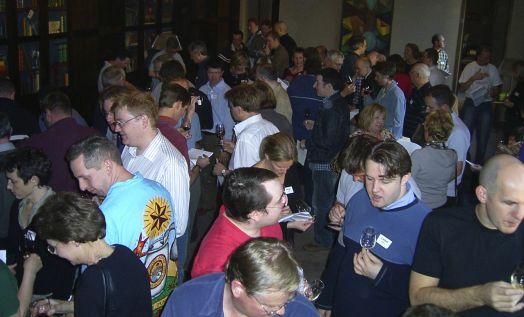 superBOWL 2004 was a national “off-line”; a gathering of wine nuts who meet on the UK Wine Forum. The superBOWL event is a celebration of wine. It is a totally non-commercial event, and most of the wines – rare and expensive – are brought along by the attendees, who have raided their cellars to turn up a special bottle or two they want to share. This was the third annual superBOWL 100 wine-lovers gathered in Glasgow. Below you will find brief introductions to the main highlights of the superBOWL weekend, along with links to various reports and hundreds of tasting notes. On the evening before superBOWL, four fine wine dinners for several dozen early arrivers took place in various Glasgow restaurants, who had agreed to allow the superBOWLers a BYO policy on the evening. Report on Ubiquitous Chip dinner here. Report on Chardon d’Or dinner here. Report on Rococo dinner here. The afternoon session of superBOWL was is centred around a walk-round tasting of an absolutely amazing array of fine wines. You can read tasting notes on all 100 wines, compiled by several superBOWLers, here. 1: Viña Bajoz and the wines of Toro: Spain’s most exciting region? Bibendum Wine, Raeburn Fine Wines, Champagne Boulard, Highland Spring. superBOWL 2004 was if anything, even better than previous years. For one of the biggest and best quality wine events in the UK it is also incredibly friendly and low-key, with little formality or ceremony. Over 400 were wines poured on the day, with superBOWLers travelling from all over the UK and the continent to be there. Though it is an event to delight even the most serious wine geek, it is without doubt the sense of camaraderie and sheer fun that sets superBOWL apart from anything else I can think of in the UK wine calendar. Finally, my thanks to all the individuals who gave time and effort so generously on the day: the speakers for the seminars, the supplier of 650 tasting glasses, the Corinthian for their hospitality, and the fantastic team of helpers who carried wines; poured wines; refilled ice buckets, emptied spitoons and on and on. My thanks, of course, to all the superBOWLers who made the event what it was.